We frequently advise our followers to download a “wake-me-up” mobile app to warn you when severe weather is imminent. When our followers ask, "which one specifically?" 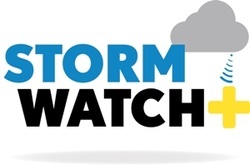 we proudly recommend StormWatch+, an app developed by our friends at Cirrus Weather Solutions, LLC in Memphis. StormWatch+ sends alerts to your iPhone or iPad whenever severe weather threatens your specific location. Combining warning polygons issued by the National Weather Service and your precise location, alerts are sent only if you are directly threatened. StormWatch+ sends alerts for up to three (3) static locations you enter anywhere in the U.S., as well as your current GPS-determined location – a feature called StormWatch+ EnRoute. AFTER DOWNLOADING THE FREE STORMWATCH+ APP, YOU WILL WANT TO PURCHASE THE ALERT FUNCTIONALITY VIA IN-APP PURCHASE. ENTER NASHVILLE AS A REFERRAL CODE WHEN REQUESTED.